The mushrooms spoke to me. I’m sure of that. They told me they grew from spores left here by aliens. They told me that through them I could connect to other worlds, to other forms of consciousness. They told me they were aliens themselves, rooted in earth’s soil, that they were sentient and could talk to us when we ate them. I had, in fact, eaten them in the parking lot at the Grateful Dead concert at the Hollywood Bowl, where we’d bought them from a guy calling out “doses.” We thought he was saying “Joseph” until we finally figured it out. They tasted like dry shiitakes, and for a while nothing happened. But then they started talking, and the blue and orange and purple clothes of the people spinning on the other side of the arena formed paisley planets, and the alien voices seemed to come out of the drum and also from the inside of my head. Everything was too much, but also exactly what I needed to hear at that moment, spring quarter of my senior year of college, when I’d just had an abortion and didn’t know what I was doing, what would happen next, or where I’d finally land. When a friend of a friend drove me home on the 405, I began first to cry, and then to bawl, about blood and life and confusion, about worry and wonder, about the beauty and terror of it all. 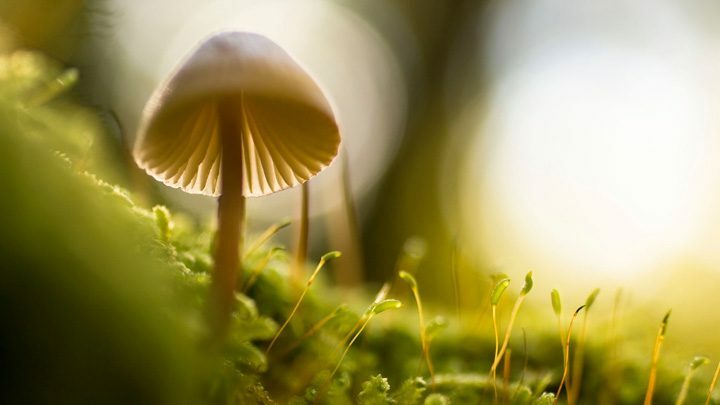 I opened the window to feel the cool seabreeze blowing inland, and I could still hear the mushrooms as they whispered about life, about promise, about the mystery and magic of other worlds. Vivian Wagner is an associate professor of English at Muskingum University in New Concord, Ohio. She’s the author of a memoir, Fiddle: One Woman, Four Strings, and 8,000 Miles of Music (Citadel-Kensington), and a poetry collection, The Village (Kelsay Books). Visit her website at www.vivianwagner.net.